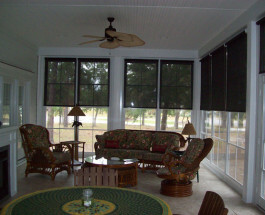 Solar Shades are the perfect complement to a custom built Southern Exposure Sunroom. 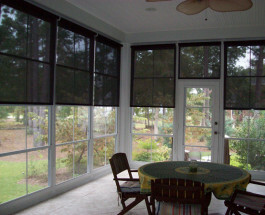 Our expert installers are uniquely qualified to install your custom sized shades on our aluminum framing system. 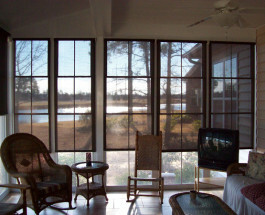 Solar Shades are a great solution for controlling the light while maintaining the view. 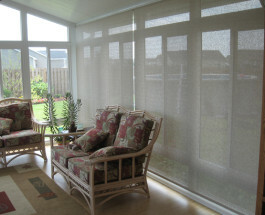 They both soften excess daylight and reduce the sun’s glare, and help regulate the temperature. Our Solar Shades come in a gorgeous range of stylish fabrics with different weave options and earth tone colors to choose from. 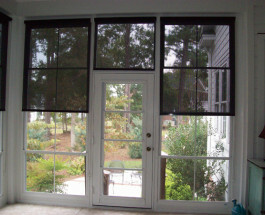 The single control continuous loop chain is easy to use to raise and lower your shade to any height on the window. 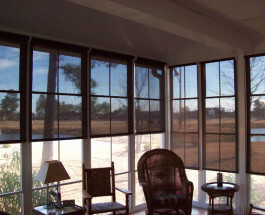 Please give us a call for a free estimate or stop by our showroom to view a sampling of our Solar Shade options.